Laurens County District 55 Schools are partnering with United Community Bank and the Capitol Theater to recognize one student in each school each semester. Each school’s winner each semester receives two tickets for a movie of their choice in the ‘Students U Make a Difference’ program. This effort aims to reward students in District 55 who have gone above and beyond to help others in each school and who have made a difference for their peers. 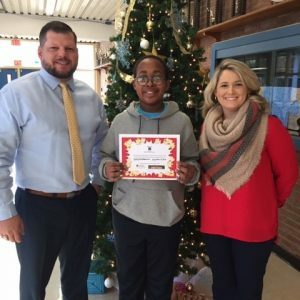 At Laurens Middle School, 8th grade student Andy Robertson was selected as that school’s first winner. In addition to being a great student, Andy is a friend to all, an active member of the Recycling Team, a faithful member of the LMS Flag Crew, an active member of the FCA Leadership Team, and is the Laurens Middle School Student Council president. Andy is pictured here with Laurens Middle Assistant Principal JR Reid and Principal Anna Brink.